Your pathology was terrible. There’s nothing you can do or we can do that will extend your life one hour. Well, at least you don’t have AIDS. I don’t want you to feel guilty. It’s not your fault you got cancer. I don’t know why we’re doing this radiation protocol; there isn’t that much hope. It’s only Hodgkin’s. It’s no big deal. There’s no reason you should be upset about this. Ask questions and tell people what you want and what you are concerned about. Someone has to be in the 15% survival figure and it might as well be you. We will treat this cancer and then you will get on with your life. Something good will come of this. In this list, it is quite easy to identify the helpful—and the harmful—statements. As health care professionals, it may not be as easy to recognize the power that our words can have. They may be uplifting or they may create word wounds. A decade from now, a cancer survivor may still use your words as an example of a negative communication exchange, or your words may still have positive meaning for the individual. An individual’s hope for the future is intensely personal and unique. For many persons faced with serious illness, a sense of future outlook that is positive and productive can be hard to maintain. Sharing hope is seen as a sign of confidence and close human relationship, and it implies great trust in the other person’s understanding and thoughtfulness. It also deserves the same level of confidentiality as other therapeutic issues. It is extremely important not to be biased against hope in general, not to think only in terms of therapeutic hope, and not to favor solutions simply because they are reality-based. You need to understand the importance of hope for your patients, and to help them use their hope to enhance their quality of life. Sometimes, as caregivers, it is difficult to maintain professional hope. When you find your own vision of hope slipping, you need to reevaluate your measures of success. This may require moving beyond disease out come measures to focus more on quality of life issues and psychosocial successes. Psychosocial successes are those identifiable and significant events, facilitated by the caregiver, that contribute to the emotional well-being of the patient and family. Helping a patient meet a goal, returning to work for example, should be hope-reinforcing for the professional. Take note of and comfort from these events and use them to rediscover your vast capacity for professional and personal hope. 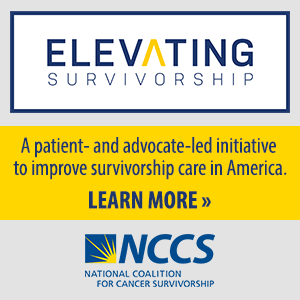 Perhaps the most important thing we can do in our treatment centers is to provide a “community of hope” for our patients, to give the message that we are hopeful about cancer survivorship and hopeful for the individual patients treated there. A community of hope fosters trust and openness and teamwork. It provides support and continuity of care. It allows for individual differences in coping with cancer and accepts all visions of hope that patients and their family members bring to the treatment process. No matter what the disease stage, every patient has the right to be hopeful, and every health care professional has an obligation to support their patients in their visions of hope.